“It is vital that the French people know about TTIP’s content and its motivations in order to be able to fight it. Because our fellow countrymen must have the choice of their future, because they should impose a model for society that suits them, and not forced by multinational companies eager for profits, Brussels technocrats sold to the lobbies, politicians from the UMP [party of former president Nicolas Sarkozy], who are subservient to these technocrats,” Le Pen said during a press conference in Paris. Since 2013, open-ended negotiations between Washington and Brussels have drawn up the framework for the agreement, intended to standardize legislation and bring down trade barriers between them. As per US practice, the contents of all economic treaties are classified. The EU has recently set up reading rooms throughout Europe for officials with clearance – but only a few thousand people have had access to the working documents. 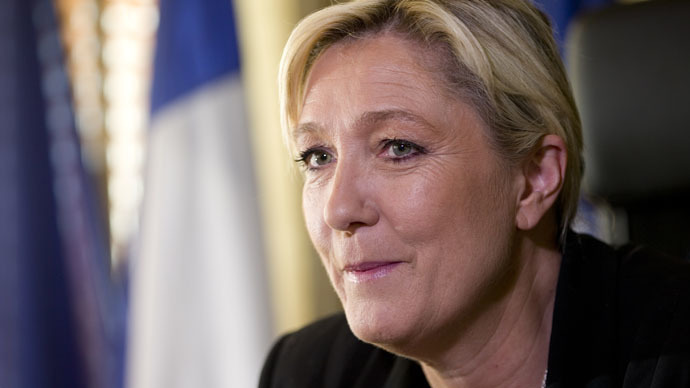 Le Pen hit out at the secrecy of the negotiations, which have featured mostly bureaucrats from the European Commission, the EU’s executive body, and nebulous “stakeholders” from businesses and public organizations. As a member of the European parliament, she forwarded a motion for greater transparency in negotiations last year. Le Pen’s motion was defeated. She is now hoping for grassroots support. “I am convinced that we can push back the TTIP if the peoples are informed of its content, and if they decide themselves to join us in order to express their disagreement concerning this treaty,” Le Pen told journalists. Both of France’s leading parties have endorsed the treaty, but Le Pen is relying on strong the anti-European sentiment that propelled her party to first place in last year’s elections for the European parliament. While TTIP’s authors promise that the treaty will bring an extra 0.5 percent GDP to Europe and the US, figures across the political spectrum have expressed concern. US President Barack Obama, who is also negotiating a similar treaty with Asia, was defeated by his own party in the Senate last week when he asked for fast-track approval to handle negotiations. Additional votes will be required if the proposed legislation is not to be bogged down in the US chambers of Congress. Meanwhile, European legislators have raised a host of issues, in particular concerning the investor-state dispute settlement (ISDS) mechanism outlined in the treaty. The controversy centers on the proposed special economic tribunal, which would operate outside the traditional legal system and allow corporations to challenge governments. In April, thousands took to the streets of Brussels, Madrid, Berlin and Helsinki to protest against the secretive deal.